Katherine Young Steele is the newly appointed principal oboe of the Milwaukee Symphony Orchestra, where she holds the Milwaukee Symphony Orchestra League Oboe Chair. 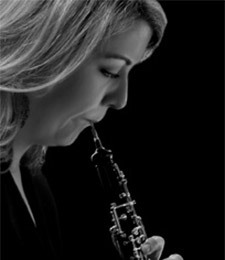 Previously, she served as principal oboe of The Florida Orchestra in Tampa Bay, a position she held for five seasons. With the Florida Orchestra, Katherine was featured as a soloist in Bohuslav Martinu’s Concerto for Oboe, and participated in a cultural exchange in Havana, Cuba. Since 2008, Katherine has served as co-principal oboe of the Eastern Music Festival in Greensboro, North Carolina. She has also served as guest principal oboe in the Saint Paul Chamber Orchestra, the San Diego Symphony, and the Sarasota Orchestra. From 2003 to 2007, she was a member of the New World Symphony in Miami Beach, Florida, and toured with the orchestra to the Accademia de Santa Cecilia in Rome and twice to Carnegie Hall under the baton of music director Michael Tilson Thomas. She has performed in the music festivals of Tanglewood, Spoleto USA, Banff, Music in the Mountains in Durango, Colorado, and with the National Repertory Orchestra. A passionate advocate for music education, Katherine maintains an active teaching studio. She has served on the faculties of the Eastern Music Festival, the University of Tampa, St. Petersburg College, and Blue Lake Fine Arts Camp. A native of Lancaster, Ohio, Steele holds a Bachelor of Music degree and the prestigious Performer's Certificate from the Eastman School of Music, and a Master of Music degree from Rice University’s Shepherd School. Her primary teachers include Richard Killmer, Robert Atherholt, and Donna Conaty.